3 Best Practices for Optimal Facebook Posting — CROWD. When approaching best practices for marketing on a platform as expansive as Facebook, it can be hard to know where to begin. Even taking into account factors like last years major newsfeed overhaul, meant to focus engagement, Facebook remains a touch and go outlet for media referral. With this in mind, SEO platform BuzzSumo set out to analyze millions of Facebook page posts from last year to determine optimal posting times, lengths, mediums, and so on. Find below three key takeaways from the study. Video has been steadily growing in popularity on Facebook for years now-encouraging almost 60% more engagement than other post styles. This considered, short form video will definitely be something to invest in in the coming year. With experts suggesting video come in at 70% for page content, it’s a good time to start looking into the range of video styles and options employed by popular pages. Though this suggestion can be dependent on your target audience, the research showed that overall, evening was the most high-traffic time of day for the site. This finding makes perfect sense, as people are most active on social media after school or work hours. 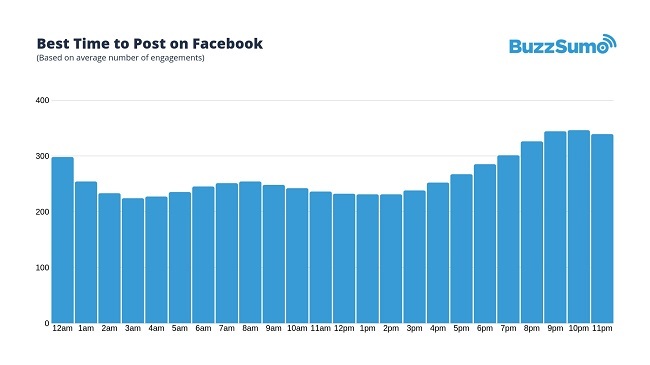 On a similar wavelength, BuzzSumo found that the weekend also sees the most page engagement. As with the above, it is still important to take your desired audience into account. Is your audience international? Consider different tactics. Depending on who you’re trying to reach, more universally true tips, like writing shorter posts to accommodate average attention spans, may be a better fit.